All people know the discouragement of self-critical thoughts, but some of us have a deeper struggle with consuming and enslaving introspection. Self-reflection run amok is a common trouble among Christians and one to which author/pastor Jared Mellinger can relate. 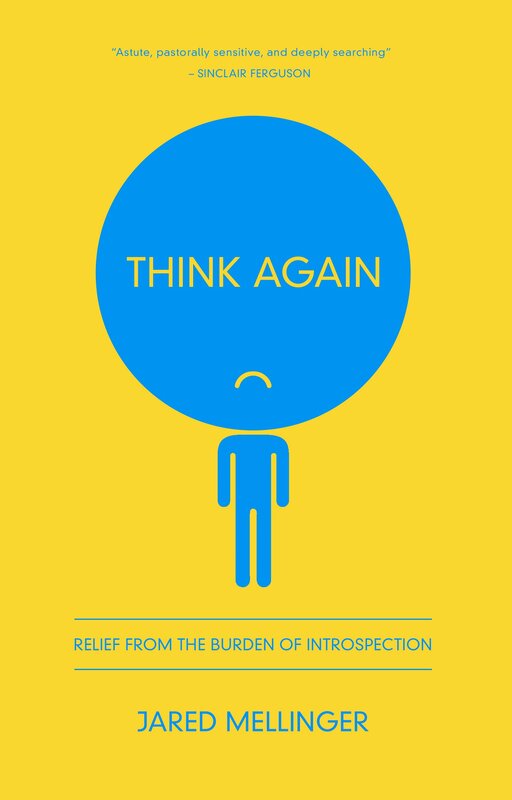 In Think Again Mellinger offers a gospel-based response to the “burden of introspection.” The book avoids the extremes of both self-absorption and self-ignorance by putting reflection in proper relation to God and the gospel. This short book is a useful tool for analyzing the problem and pointing to the solution of unhealthy introspection. I was not familiar with Mellinger prior to reading this book, which I picked up in the process of looking for some resources to share with a friend. His pastoral heart comes through clearly in the book as he writes with compassion, care, and insight. He also writes, however, as a fellow sufferer in the battle against consuming self-criticism. Many of his illustrations demonstrate this, as does his sensitivity to the common barriers to overcoming these thoughts. The book is short, accessible, and incredibly warm in its approach to the subject. I am sure many will find it helpful. The books thirteen chapters build a progressive case for understanding the dangers of too much introspection and working readers towards the gospel-based solutions. Mellinger understands the problem is not rooted in self-reflection per se. Christians, after all, are called to be self-reflective. To analyze their obedience, faith, and even their salvation (2 Peter 1:10). The danger lies in the goal and orientation of such self-reflection. Self-reflection run amok often has a subtle goal of self-worship, but healthy self-reflection has a different goal: …self-analysis and self-knowledge are not the endgame, but a doorway to a life of love, obedience, and joy (12). That is to say, healthy introspection seeks to help us grow in looking more like Jesus and loving others as He does. It’s the difference between the “centripetal force that pulls us inward” and the “centrifugal force that pushes us outward” (11). Chapters five, six, and seven propose plans for addressing this problem. Here Mellinger addresses strategies for fighting doubt, despair, and false guilt. He also gives some practical tips on healthy self-examination. Chapters 8, 9, and 10 zoom out to consider the bigger picture. So, Mellinger gives us some guidance on how to see the good in ourselves, the value of seeing our sins more clearly, and the danger of more general “hyper self-awareness.” Chapters 11-13 round out the book by guiding us outside ourselves to see creation, community and Christ. The big picture goal is not simply to get better at critiquing ourselves, or freeing ourselves from critique. Rather, the goal is to be so intoxicated with God that we can rightly evaluate ourselves and embrace the freedom found in the gospel. We are never going to be “good enough” and yet while the gospel frees us from the fear of condemnation it also promotes personal growth in godliness. Mellinger gives us, then, a tool that is beyond self-help and yet not devoid of practical guidance for improvement. Think Again is a really helpful book in analyzing our introspection. His chapter on false guilt was incredibly insightful and gave some great tools for me to use with myself and with counselees. There are times where his suggested solutions can sound too simplistic. In some chapters it feels as if Mellinger is simply saying, think bout Jesus more than yourself – which, while true, doesn’t really help people think less about themselves. At other times, however, he provides more nuanced guidance through the maze of self-reflection. In conjunction with a godly, mature, spiritual friend or Biblical counselor I believe this book would be really useful in counseling situations, and I found it encouraging to me personally. If I were to rate it, I’d give it a four out of five stars. « What is Keeping You From Being Patient?